Contemporary writings inform us that the prison occupied an area of 63/4 acres. It had a curtain wall with massive posterns in front, with a large entrance gateway, designed by Barry, the arches filled with portcullis work. From the main building rose an `Italian' clock tower. Four wings radiated like the spokes of a wheel from one long entrance hall leading to the centre. The interior of the 4 wings were fitted with 130 cells, arranged in three `galleries' one above the other. "Every cell is 131/2 feet broad and 9 feet high, and contains an earthenware water closet and copper wash basin supplied with water, a three legged stool, table and shaded gas burner and a hammock for slinging at night, furnished with mattress and blankets. In the door of every cell is an eyelet-hole through which the officer on duty may observe what is going on within from without. Each of the cells is said to have cost, on an average, upward of £150." "The building is heated by hot water in the basement and the ventilation is maintained by an immense shaft in the roof of each wing. 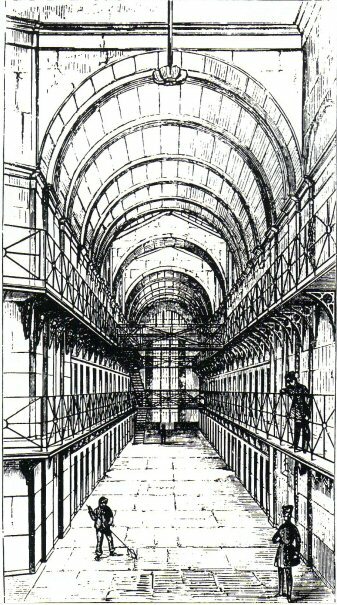 There are exercising yards for single prisoners, between each of the radiating wings, and two larger yards either side of the entrance hall - for exercising large bodies of the prisoners collectively. There are artesian wells for supply the prison with water, and a gas factory for lighting the buildings." 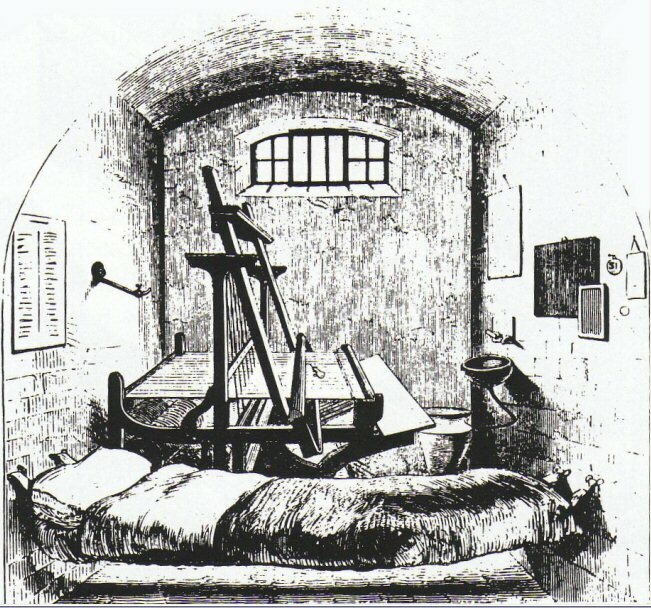 A contemporary at the time has given a visual picture of what it was like to visit Pentonville. It is both a little flowery and long winded (it has been abbreviated where possible) but it does provide a real impression of the establishment at the time. "No sooner is the prison door opened in answer to our summons at the bell, then we might believe we are inside some little park lodge, so cosy and tidy and un-jail like is the place. The officer, as he holds back the portal and listens to our enquiry as to whether the Governor be visible, raises his hand to his glazed military cap and salutes us soldier fashion, as he replies lively 'Yessir!' We are then ushered across a small paved court-yard, then up a broad flight of steps to the large glass door that admits us to the passage leading to the prison itself. The officer who accompanies us is habited in a single breasted, policeman like frock coat, with a bright brass crown bulging from its still stand up collar, and round his waist he wears a broad leather strap, with a shiny cartouche box behind, in which he carries his keys. We are then at a long broad passage, which is more like a lengthy hall to some government office, than the entrance to an old fashioned jail, and at the opposite extremity we can see through the window of the other door, figures flitting backwards and forwards in the bright light of what we afterwards learn is the "centre". The first thing that strikes the mind on entering the prison passage is the wondrous and perfectly Dutch-like cleanliness pervading the place. The floor has been polished by continual sweeping, is so bright we cannot believe it had not been black leaded .... We enter our name in a book and on whose permission we have come, and are then taken to the Centre by a warden. When we first entered the prison, the lengthy and high corridors, with their sky light roofs, seemed to us like a bunch of Burlington Arcades that had been fitted up in the style of the opera box lobbies, with an infinity of little doors - not only one after another but one above another, three storeys high, like a man of war with its handed port¬holes. Half way down each corridor, a light bridge, similar to the one joining the paddle-boxes on board a steamer, connecting the galleries on either side of every floor. Pentonville's distinctive feature - and one that renders it utterly dissimilar from all other jails - is the extremely bright, cheerful and airy quality of the buildings, so that it strikes the mind as a bit of the Crystal Palace, stripped of all its contents. There is none of the gloom, nor dungeon-like character of a jail. So admirably is the ventilation of the building contrived and kept on, that we feel immediately we set foot in the place, how fresh and pure the atmosphere there. So each captive breathes in the "free air of heaven" since in the open country itself it could not be less stagnant than in the "model jail”. The cells distributed throughout this magnificent building, appear to an outsider as really comfortable apartments. On the ground floor a number are fitted with looms so there is not a superabundance of room. In a number of cells there was to be found a brown paper covered book or periodical which the prisoner has been supplied from the prison library. On the wall there is a pasteboard bill headed "Notice to Convicts" and the "Rules and Regulations" of the prison. There is also a card with the prisoner's "registered number" for in Pentonville all names cease. Further there is in the corner a button, which on being turned, causes a small gong to be struck in the corridor without, and at the same moment makes a metal plate of "index" outside the door start out at right angles to the wall, so that the warden, when summoned by the bell, may know which prisoner has rung. The prison was originally built only 3 floors high above the ground. It was some years later (due to the pressure of numbers) that a fourth floor (the fives) was added on top of the original structure. It was at this point that the roof structure was altered and the central clock tower removed. Evidence of this later addition still exists. If you measure the height of cell door frame on the lower landing of say A Wing, they are smaller then the cell door frames on the fives.